A decision on the future of Michael Cheika as Wallabies coach is set to be made this month. 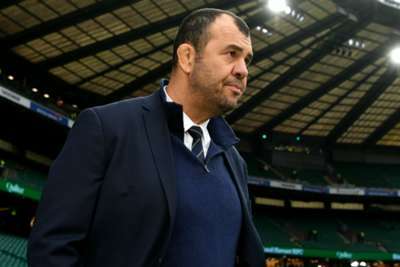 Cheika has been under significant pressure as Australia have struggled for consistency under his leadership, the Wallabies winning just four of 13 Tests in 2018. Rugby Australia will conduct a thorough review after receiving a presentation from Cheika, who led the Wallabies to the 2015 World Cup final, with chairman Cameron Clyne expecting to come to a decision on whether he will take them into the next one in 2019 in the coming weeks. "We received a presentation from Michael Cheika and we're going through a process, so I’m not really in a position to elaborate," said Clyne. "We've had a presentation from Michael; we've had some data gathered from him, from his coaching staff, from the players and from the high performance unit. "We need to go through a fairly thorough review process, we've got all the information we need and we'll be going through that process. "I know people are very keen to know what's going on, but I just feel it was important to at least let you know where we are in that process. "Obviously, we'll have more to say and have that process wrapped up ahead of Christmas."